I don't remember much about the Red Hot. But I do remember the fact that my wife and I frequented the truck stop often back in the late 1960s when we lived in Aberdeen in northern Mississippi. The Red Hot was located in Meridian. It was a "half-way" point in the early days of our marriage when we traveled a lot between Aberdeen and her hometown of Hattiesburg. Meridian was about an hour and a half drive northeast of Hattiesburg on US 11 and Interstate 59. Aberdeen was about another two hours farther north on US 45. So coming or going, depending on the time of day, the sign welcomed us along with thousands of others. The place was always busy, catering to truckers from all across the South heading to or from Atlanta, Birmingham, New Orleans or Jackson, MS or points farther east and west. I ordered the t-bone steak special which I enjoyed. Don't remember the sides but it had to be a baked potato and some peas along with a roll and some coffee. Those were the most common accoutrements in the South. Just this past year, upon returning from a trip to the Great Smoky Mountains National Park, we happened to go through Meridian. And this time we decided to stop and shoot a picture of the iconic sign that still lingers along the side of the highway. The truck stop was torn down more than a decade ago so the land could be available for another larger business. Looking for the Red Hot on the internet brought up some interesting items concerning paleontologists who have been digging in the area of the sign and finding interesting tidbits of the past. Others recall their "best" ever cup of coffee. Maybe the sign will continue to stand tall, and not become buried like the relics that are being uncovered. 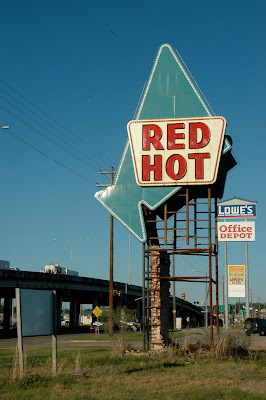 It is unfortunate that once-popular places such as the Red Hot are relegated to just memories. I guess it is just a sign of the times.